The global cruise industry generated an estimated revenue of 39.6 billion U.S. dollars in 2015, a figure which has grown by around 15 billion U.S. dollars over the last half decade. The industry made significant recovery after revenue fell below 25 billion U.S. dollars during the 2009 global recession. 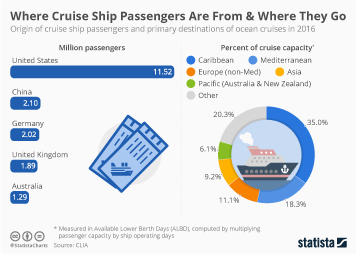 The passenger capacity of the global cruise market reached 466 thousand in 2016 and capacity was expected to continue to grow to reach 521 thousand by 2018. The average cruise passenger brought a revenue of 1,779 U.S. dollars, but, with expenses per passenger also high, the average profit was only 226 dollars in 2015. The United States cruise market is one of the largest in the world. The revenue generated there grew by over seven billion U.S. dollars over the five years leading to 2015, and it was expected to reach almost 31.5 billion dollars by 2020. In 2016, the world’s largest cruise passenger source market was North America, providing 12.41 million guests for the industry - this accounted for more than half of the total number of guests globally. With revenues almost double that of its closest competitor, Carnival Corporation is by far the largest cruise company. The second largest company worldwide is Royal Caribbean Cruises which had revenues of 8.5 billion U.S. dollars in 2016, a figure which had grown annually since 2009. The success of the cruise industry could result from travelers finding cruise vacations convenient. In 2016, the majority of Americans considered a cruise vacation to be the ideal way to visit many destinations in a short period of time. Other benefits of cruise vacations included that they are ideal for getting pampered and that they are a form of luxury travel.